A destructive Pacific storm is parked over Southern California and expected to stay that way until Saturday afternoon. Heavy rain ravaged roads, opened sinkholes and led to the deaths of at least two people. The storm feeding on an atmospheric river of moisture stretching far out into the ocean was at its most fierce late Friday afternoon, dropping over 8 inches of rain in one area. Two vehicles fell into a 20-foot sinkhole in Studio City Friday and firefighters had to rescue one woman who escaped her car but was found standing on her overturned vehicle. 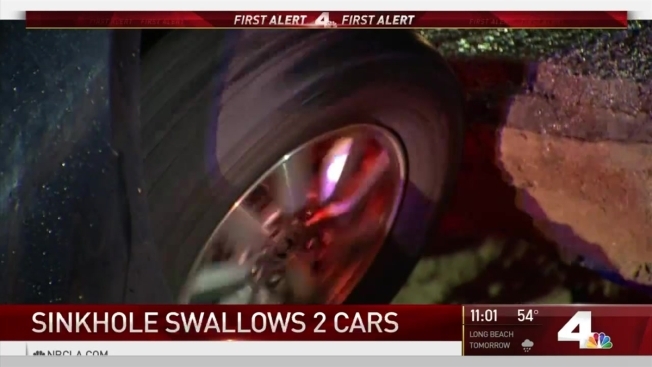 Two vehicles fell into a 20-foot sinkhole in Studio City, California, Friday. Firefighters rescued one woman who'd manage to crawl out of her vehicle but was still stranded on the car's roof. in the Inland Empire, three firefighters managed to safely escape before their fire engine fell down 50 feet off the side of the freeway Friday. Authorities in San Bernardino County say a motorist has been found dead after a car was submerged on a flooded desert road in Victorville. Fire Department spokesman Eric Sherwin says another person was rescued by helicopter from the roof of a car that was swept downstream during the fierce storm. It's the second confirmed storm-related death from the powerful storm that has lashed Central and Southern California Friday. 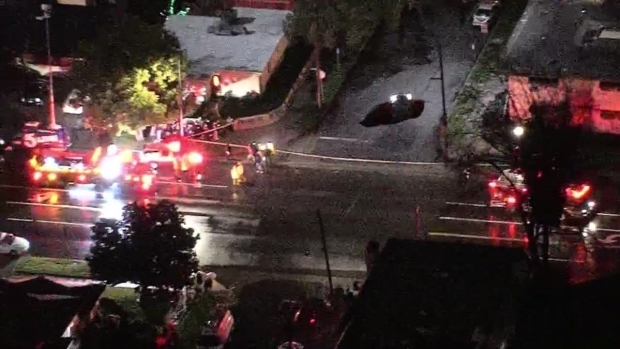 Earlier, a 55-year-old man was electrocuted in the Sherman Oaks area of Los Angeles when a fallen tree downed power lines and fell on a car. In San Diego, several giant eucalyptus trees fell on State Route 163 just north of downtown, crusing the hood of one car. The driver escaped injury but the route was closed for hours inorder to remove the trees. In what may be one of the most memorable moments of the storm Friday, a big rig driver navigated a flooded patch of Interstate 5 in Los Angeles.